As most of you may know, we did a gender reveal to discover if baby K was a boy or a girl. We wanted our whole family to be a part of our celebration as they are all first-timers too! First time grandparents. First time aunts. First time uncles. And of course, first time parents. It was an outstanding, thrilling, surprising experience! Between this, a ball game, and Memorial Day Weekend, my camera got a workout! 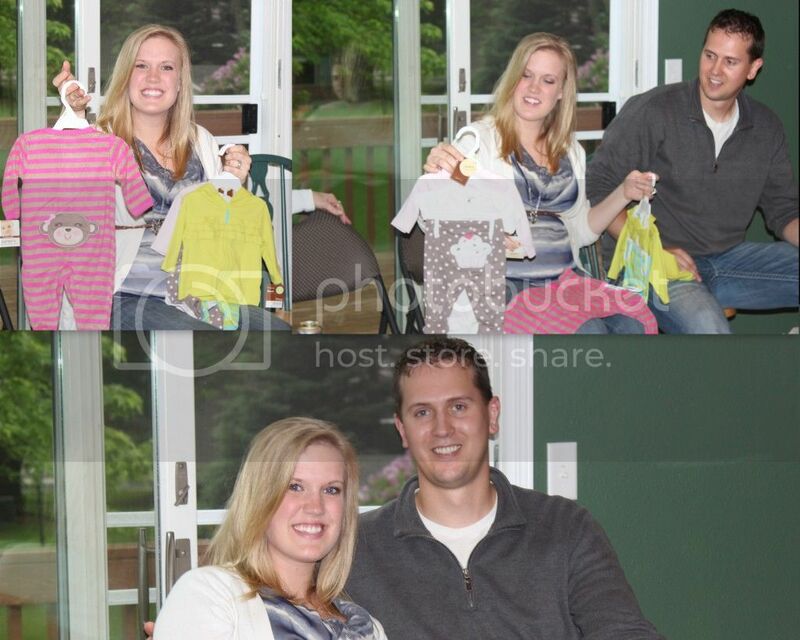 Here are the pictures from the gender reveal. Getting ready for this gathering may have definitely stressed me out. A lot.Especially when my sweet husband was running around taking pictures of ev-er-y-thi-ng. Seriously. He was amazed by his picture of chips. Then he asked for a picture of our baby. I couldn't resist the smile this provoked. 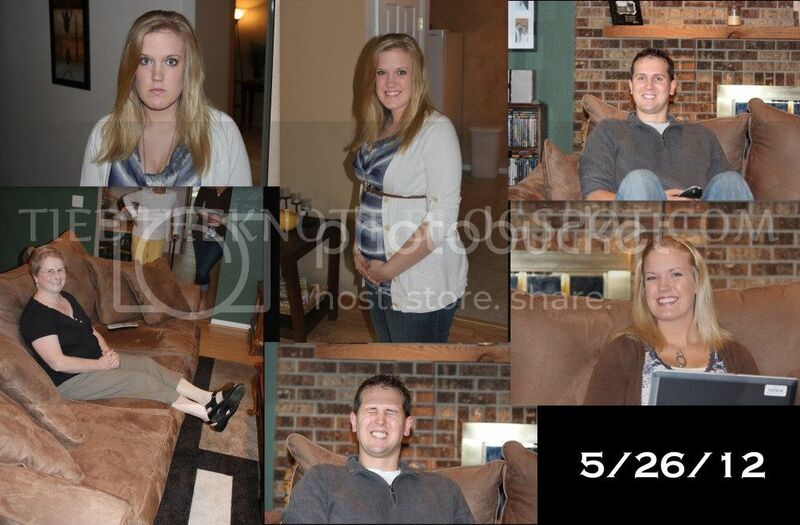 The top right is daddy-to-be Tyler. 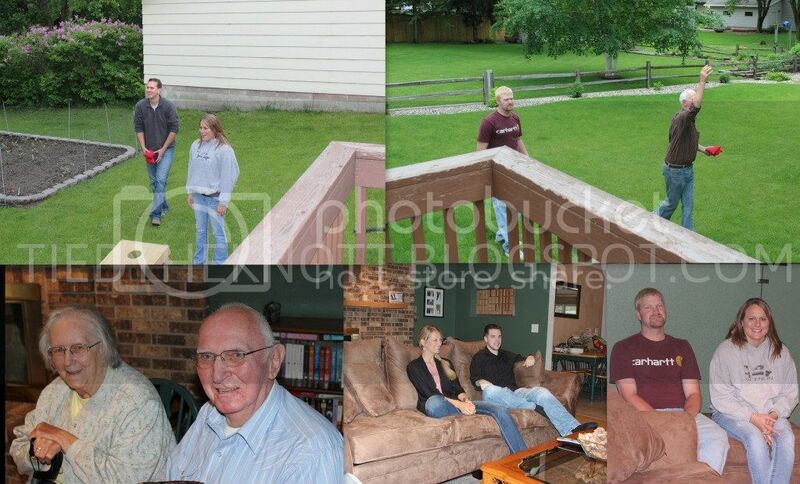 Bottom left is my g-ma sitting on our big-people couches. She fit very well! Ok, maybe not. But it was funny! Next is excited dad Tyler. Finally, last but certainly not least, aunt Becca. She was working and waiting for family to arrive. Before we found out, we played games and sat around chatting. I mean, who (besides me) REALLY does dessert first? We played bean bags, bocce ball, and sat around enjoying some friendly conversation. We all enjoyed an abundance of food pre-discovery-dessert! 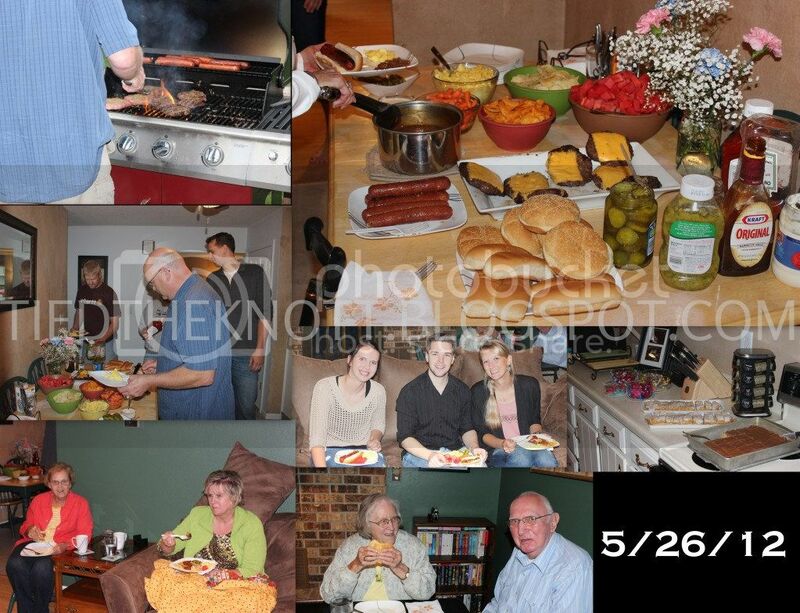 My dad grilled the burgers (which he brought) and hot dogs (which he bought). Such a good man. next, look. at. that. spread. Yum. We did buffet style serving. Ooooooh Boy! (You'll have to excuse my hair. It was rainy/humid/gross outside.) I LOVED the cupcakes. They were cute and delicious. 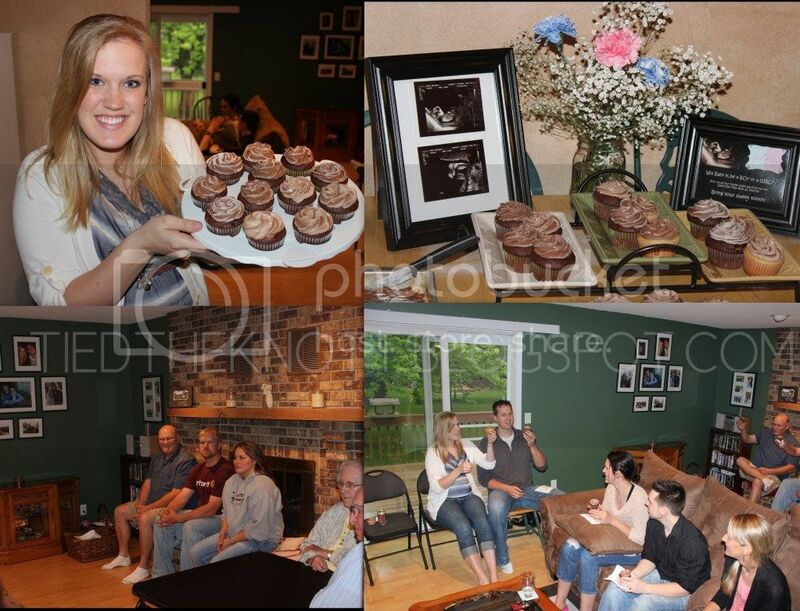 Bottom left is the family waiting to be served (with smiling grandpa Jeff) and on the right, our cupcake cheers. Tyler's and my reaction was something to be remembered because we were shocked. I was 100% certain she was a boy. 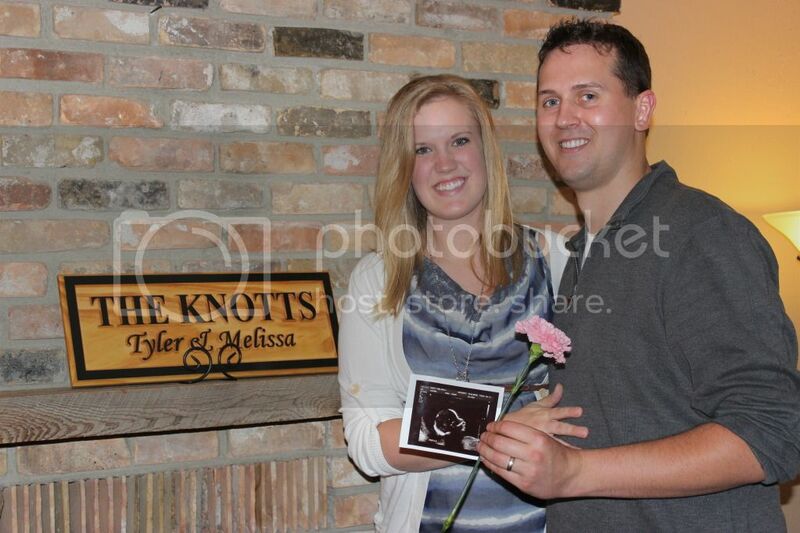 Tyler thought girl until a few days before at our ultrasound. Starting at the top right: I peeked. I wouldn't show Tyler what I had, but the tears started coming! So he looked and was SOOOO surprised! We had to check and double check the frosting. Notice Tyler's eyes stay big the WHOLE time. He was in shock. Smooches for mom and dad. Finally, our pink surprise. SO excited. Proud mama and daddy to be. Can't wait to meet our baby girl! Congrats! You both looked like you had a blast and I love those pjs! Too stinking cute!! What a great photographer you have... What a great weekend! I don't think I have ever seen either of you two smile so big as when you opened your cupcakes. You looked at me with one of those "if I was wrong then you were wrong" looks. And I loved it. Have a great day Melissa! PS: I love your selection of photography equipment. Ohhh boy is that little girl going to be the most photographed child ever. Yay! I am so happy for you guys!!! 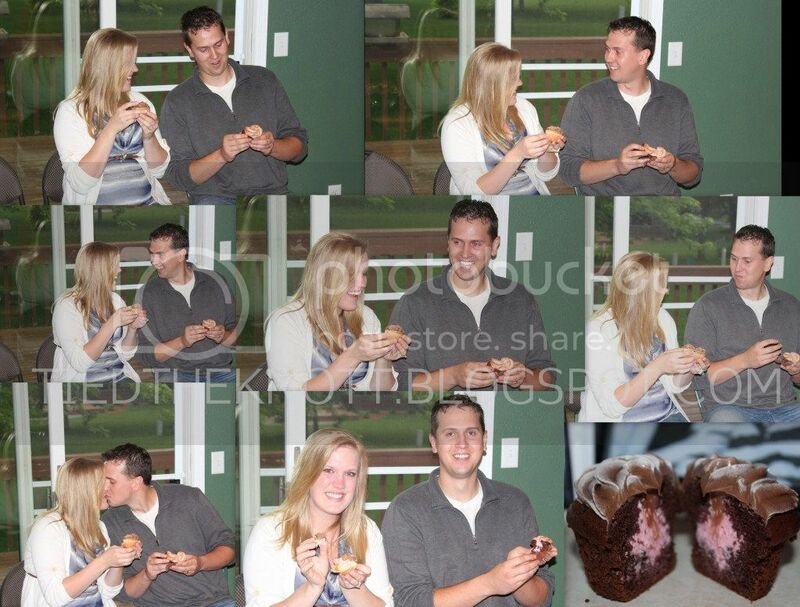 I love your cupcake gender reveal party :) I would not have been able to not look beforehand!